After a successful mandatory mini-camp that saw quarterback Andrew Luck throwing his first passes in almost a year, the Indianapolis Colts are breaking for the summer before reporting for training camp in a little more than a month. We’re taking a look at the last leg of the 2018 season schedule, with weeks 14 through 17. A familiar foe in Week 14, the Colts will travel to Houston to take on the division-rival Texans for the second matchup of the season at NRG Stadium. A matchup of two teams in similar positions, the Dallas Cowboys come to Indianapolis in Week 15 to face the Colts. Despite retaining head coach Jason Garrett, the Cowboys are not without roster turnover in 2018. The team lost two of its premier pass catchers in wide receiver Dez Bryant (released) and tight end Jason Witten (retirement), as well as two defensive staples in linebacker Anthony Hitchens and Orlando Scandrick. However, returning the core of running back Ezekiel Elliott and quarterback Dak Prescott means the offense is on track to continue flying high, leaving this Week 15 matchup a defensive test for the Colts new-look defense. A matchup formerly circled on Colts fans’ calendars due to the matchup of Mannings, quarterback Eli Manning and the New York Giants will roll into Indianapolis to face the Colts in Week 16, sporting a fresh new-look and younger team on both sides of the football. Despite losing key players such as defensive lineman Jason Pierre-Paul and wide receiver Brandon Marshall, the Giants reloaded on both sides of the ball, drafting star running back Saquon Barkley out of Penn State, signing former New England Patriots offensive lineman Nate Solder and trading for former Los Angeles Rams linebacker Alec Ogletree. Barkley, who many speculate was on the Colts’ 2018 NFL Draft wishlist, looks to be the featured piece of this Giants offense moving forward, giving the Colts new defense a tough task at hand late in the 2018 NFL season. 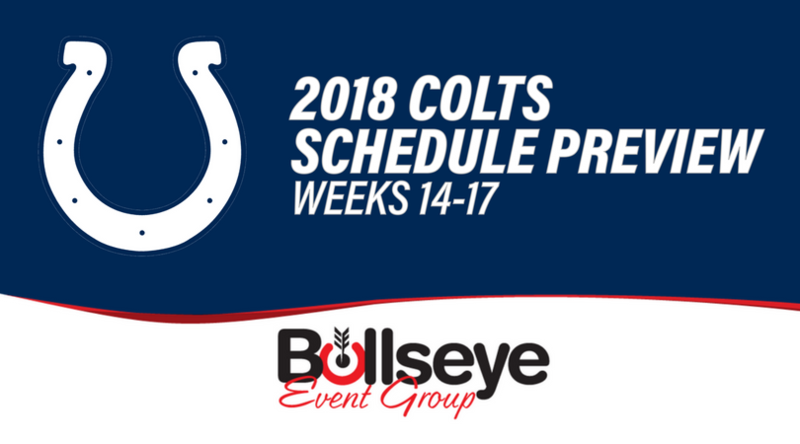 In Week 17, the Colts will round out the 2018 regular season against a familiar foe in the division-rival Tennessee Titans, traveling to Nashville and Nissan Stadium.